For most adults, it is hard to imagine there was a time when we couldn't read a map. For most of us, making sense of a map is as automatic as re-creating a scene in our minds from the dots on the page that make up a photograph. Of course we were not born able to make meaning from either photos or maps, but that doesn't make it any easier to project back to the time when photos and maps were just colors and shapes on a piece of paper (or a screen—for younger adults). In fact, the ability to "read" a map, even a very simple one, is a skill that must be learned and can require considerable time and effort. Although nearly everyone acquires the basic map reading skills by the time they have completed the primary grades, that does not diminish the magnitude of these accomplishments for young learners. Also like reading and basic math, learning to read a map is a foundational skill that is an essential prerequisite for subsequently developing a wide range of knowledge and skills. A brief review of the media that children see in their schools, homes, and communities reveals how frequently maps are used to convey important information and relationships. In the most recent National Assessment of Educational Progress in Geography (conducted in 2010), 58 percent of fourth grade teachers reported that they use maps or globes in their instruction at least once a week. For this reason, a delay in learning to read maps or a lack of proficiency in reading maps can be an obstacle to academic and intellectual progress. 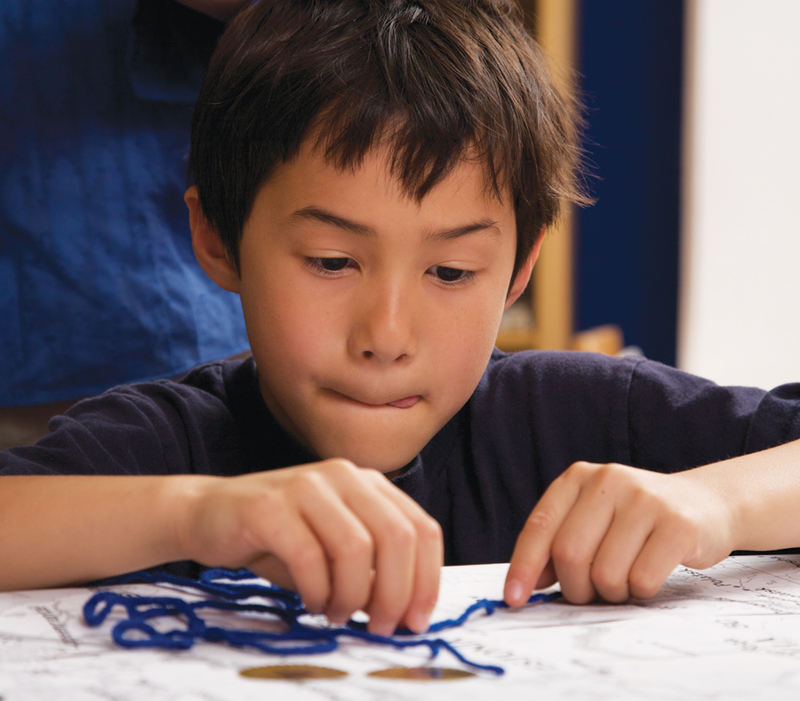 The 2010 National Assessment of Geography revealed that only 21 percent of fourth graders in the United States were performing at grade level in an assessment that included basic map skills, among other geography content and skills. This number drops below 10 percent for students identified as African-American or Hispanic. Unfortunately, map skills are not taught as consistently across the country as they should be. Nor do many primary grade teachers have the instructional materials or know how to teach map skills. For that reason, National Geographic's Network of Alliances for Geographic Education recently launched an initiative to improve the teaching of map skills in the early grades. Led by Brenda Barr and Kim Hulse at National Geographic, this initiative is designed to provide teachers with the knowledge, skills, and materials they need to teach their students. The starting point for this initiative was a review of research on children's spatial reasoning and map interpretation skills commissioned by the National Geographic Education Foundation. This review, conducted by Drs. Audrey and Lindsey Mohan, collected information about the concepts and skills that children in different age ranges can master, common challenges to understanding, and misconceptions that children in those age ranges are likely to experience. These research findings have implications for teaching and selecting maps and other instructional materials. The ability to "read" a map, even a very simple one, is a skill that must be learned and can require considerable time and effort. For example, one of the findings was that students in grades 2 through 4 are able to make the transition from map symbols that are iconic or representative of objects in the world to abstract symbols. However, research also cautioned that students in this age range are still likely to make errors in interpretation and are likely to need explicit guidance about the meaning of symbols. For that reason, the instructional guidance cautions that students should be provided with maps that display a limited amount of information to help them focus on the information that is provided. The fundamental lesson of this research is consistent with research on skill acquisition across the curriculum: children should be presented with challenging tasks that demand that they learn new skills but do not overwhelm them with challenges that are too numerous or complex. They should also be provided with enough assistance to identify and correct errors and given enough opportunities to practice skills across a range of challenges sufficient for them to achieve full mastery. This specific research helps teachers understand in advance what their students will find challenging, select appropriate tasks, and guide students to overcome specific difficulties or misconceptions. Essentially, this research helps teachers understand what most of us have so much trouble understanding—what looking at a map is like for someone who has not yet mastered one or more aspects of map reading. Research on teaching across many subjects has shown that teachers are much more effective when they have this information. Imagine a second grader who is struggling to master the difficult task of determining relative direction on a map. For most of us, it is hard to imagine confusing something being on the left side of a map with something being on the left side of a location in the world. The Alliance Network materials being developed can help the teacher anticipate this confusion and diagnose the reason that our second grader is consistently making mistakes when giving directions based on a map. The teacher would also know what kinds of explanations, examples, and additional tasks to provide to help a student overcome this common misconception. While these materials and resources could make a big difference in educational outcomes for students, the Network of Alliances for Geographic Education and their partners at the National Council for Geographic Education, the American Geographical Society, and the Association of American Geographers face an enormous challenge in getting them to teachers. Training teachers could also improve geographic education. We see great potential in Esri's GeoMentor program to teach map reading skills. We encourage GIS professionals to spend some time reviewing the opportunities to get involved in with local schools on the Esri GeoMentor program website, the materials for teaching basic map skills on the National Geographic Education website, and then reach out to educators in their communities. Get more information about the Esri GeoMentor program. Get more information about National Geographic's Elementary Mapping initiative. Read other articles in the "GeoLearning" series.